This kit consists of 23 centromeric plasmids, derived from the pHLUM mini-chromosome, designed to restore prototrophy in common S. cerevisiae laboratory strains. The 23 single-copy plasmids complement for deficiencies in HIS3, LEU2, URA3, MET17 or LYS2 genes and in their various combinations, to match the auxotrophic background of the popular functional-genomic yeast libraries that are based on the S288c strain. This kit consists of a 96-well plate, and will be shipped as bacterial glycerol stocks on dry ice. Samples should be frozen at -80°C immediately upon arrival. Saccharomyces cerevisiae single-copy plasmids for auxotrophy compensation, multiple marker selection, and for designing metabolically cooperating communities. Mülleder M, Campbell K, Matsarskaia O, Eckerstorfer F, Ralser M. F1000Research. 2016 doi: 10.12688/f1000research.9606.1. F1000. Auxotrophic markers are useful tools in yeast cloning and genome editing, enable a large spectrum of genetic techniques, as well as facilitate the study of metabolite exchange interactions in microbial communities. If unused background auxotrophies are left uncomplemented however, the cells need to be grown in nutrient supplemented or rich growth media compositions, which precludes the analysis of biosynthetic metabolism, and which leads to a profound impact on physiology and gene expression. The Ralser Lab created a series of single copy plasmids derived from the pHLUM minichromosome. These plasmids have a native S. cerevisiae promoter for expression of the marker genes as well as a centromeric origin. Additionally, plasmids in the pHLUM series have a fragment of the E. coli lacZ for blue-white selection. The 23 single-copy plasmids complement for deficiencies in HIS3, LEU2, URA3, MET17 or LYS2 genes and in their various combinations, to match the auxotrophic background of the popular functional-genomic yeast libraries that are based on the S288c strain. The plasmids are further suitable for designing self-establishing metabolically cooperating (SeMeCo) communities, and possess a uniform multiple cloning site to exploit multiple parallel selection markers in protein expression experiments. 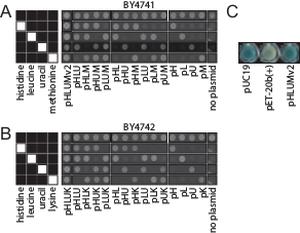 pHLUM and pHLUK minichromosome maps for yeast vector series. The pHLUM series expresses HIS3, LEU2, URA3, and MET17. The pHLUK series expresses HIS3, LEU2, URA3, AND LYS2. Maps of the plasmids generated from pHLUM and pHLUK vector parents. 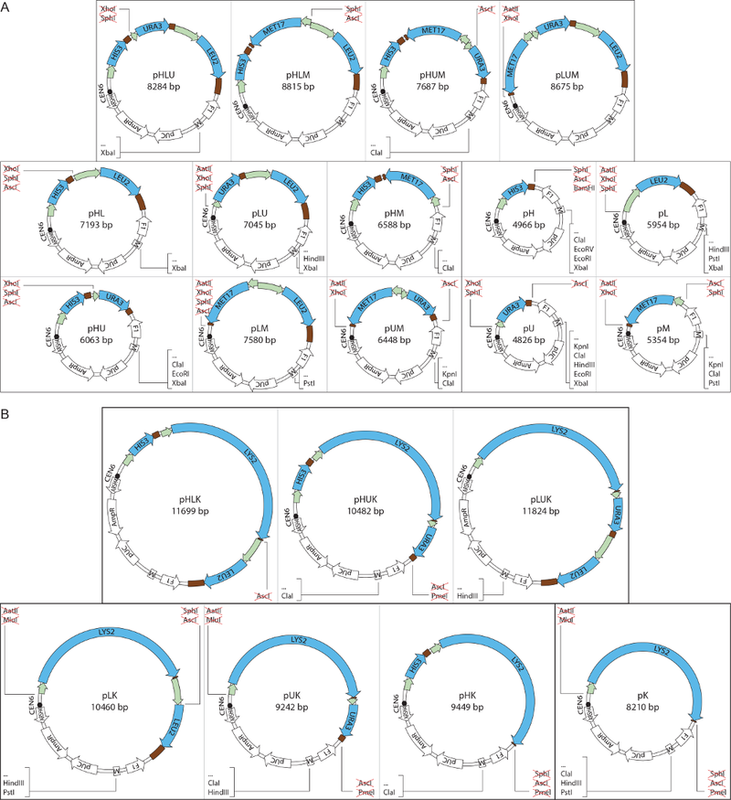 If unique restriction sites were gained or lost, it is indicated in the individual plasmid map. Yeast growth assay demonstrating prototrophy restoration with each plasmid from the pHLUM and pHLUK series. Saccharomyces cerevisiae single-copy plasmids for auxotrophy compensation, multiple marker selection, and for designing metabolically cooperating communities. Mülleder M, Campbell K, Matsarskaia O, Eckerstorfer F, Ralser M. F1000Research 2016 doi: 10.12688/f1000research.9606.1.